I forged on, and finished it up. Well, finished the quilting…I will bind this, probably with a wide black binding, like an inch, maybe? The piece is about 20 by 40, the ladybug was based on a 10.5 inch circle. I drew the ladybug and the words with a combination of washout pens and pencil (which needs to be laundered out…). I tried to do the letters freehand, but I was having trouble with spacing, so I turned to my computer and printed out letters that I sort of traced, sort of modified to make them my own. 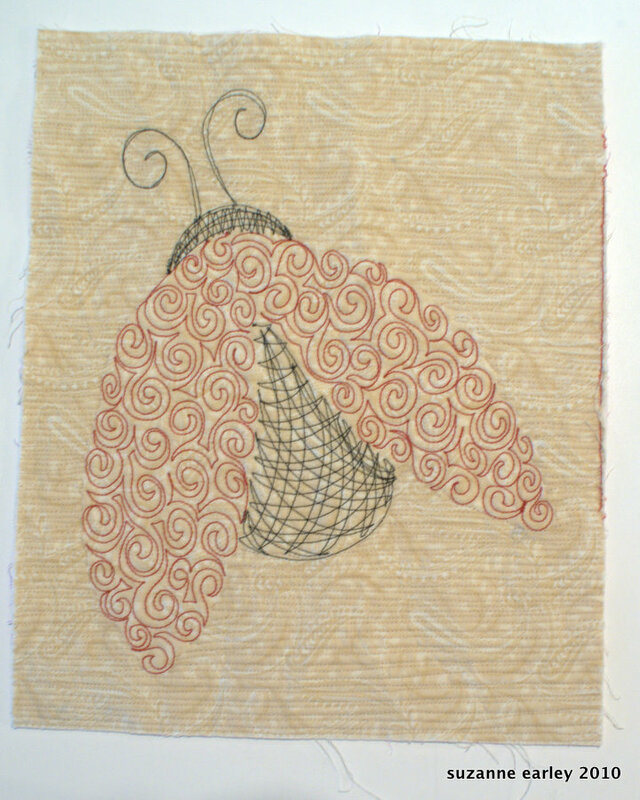 I then quilted each element with a different background fill. The overall effect from the perspective of a photograph, or even from standing away from it in person is pretty effective — I think if I did it again, I might do the SAME fill for each letter, but I wanted to experiment and see which one I liked best. I do see some spots where I didn’t get the lines of the white background fill close enough, so it’s a little poofy in those spots. Red and black thread on white is extremely unforgiving, but I also think that the thread count on the white cotton I was using was a little high. Something with a softer hand might have been better. I also chose to use 2 layers of batting (cotton/poly blend on the bottom, poly on the top), so this piece is not exactly supple. Even with a bit more of a closeup, the stitching looks pretty good, but trust me. That black and red thread shows every bit of a bobble. The U is a hot mess: that design was a mistake. The B was kind of fun, but it’s harder to make straight lines and points than you’d think, when so much of your freehand work is curvy. I like the branchy spirals on the G, but the couple of places where I had to follow the line to a new space are really obvious in that black thread. The Y and L are OKish. I was really sloppy on the L, and the petal thing I did on the Y can get kind of thready, which…again…is really obvious with such high contrast. The A and the D are my favorites of the bunch. I’m really kind of digging that spiky freehand scribbly cross hatch thing. And pebbles. Yes, they take forever, but they sure are effective. As I said above, in the future, I’d stick to one fill for all of the letters in order to make sure they all have the same density — some of the letters “look” darker than the others, simply because there is more thread, closer together. That’s actually the wrong side of the fabric, and you can see that I got a little bit confused when I was doing that scribbly black cross-hatching. Also, my ladybug’s wings are unattractively lopsided. Oops. That’s also just a single layer of the cotton/poly blend batting and…it’s TOO thin, so I need to do some more experimentation with other batting and batting combos. The fabric was a looser weave, which I liked, but I should have tried it with the double batting for a true comparison. I do like the horizontal super-close-together lines in the background, although…that’s a lot of really boring stitching back and forth and back and forth. Remarkably, I had not a single shredded thread during that whole piece, all those straight lines from right to left usually give me fits. Way back in May, when I went to the Machine Quilter’s Showcase in Overland Park, KS, I saw a wholecloth quilt hanging in the show that really struck me. It was a wholecloth, but it was based on an applique quilt by Piece o Cake Designs. I’m pretty sure it was white fabric, but the “applique” — the flowers and leaves, were quilted. I don’t recall now HOW they were quilted — if it was just outlines, or if it was filled in, like I’m playing with, or what (someone who saw it can help me here), but I really liked the quilt and thought it was a great idea. Apparently it’s been percolating in my brain all this time, because it wasn’t until AFTER I started quilting the ladybug yesterday that I remembered that quilt. When I got started yesterday, I didn’t want to thread paint — sure, I’m putting down a lot of thread, but I didn’t want to completely cover the fabric with thread. The two pieces I’ve done so far might be stiff, but they are not distorted by the application of thread. I’m also not interested in applying color via paint or ink or colored pencils. I’ve tried it, and I’m fascinated by it, but I’m bad at it. I’m a messy, messy painter. So, that’s the progress of that experimentaiton for the time being. I’m going to let it all percolate some more and will report back with further findings in the future. Some of you are probably thinking that I was being too harsh or critical, and…don’t worry. I’m not beating myself up over here. Sometimes I think we can be our own worst critics, but at the same time, I don’t think there’s anything wrong with honest constructive criticism. The point of this was to experiment, figure out what worked and what didn’t, and if I didn’t take the time to analyze what wasn’t working, then…it wouldn’t have been worth the effort. I don’t think the original piece is a piece of crap, far from it: I’m just being honest that it’s not up to what I know I can do, and while I’m not aiming for perfection, I know I owe it to myself to do the best I can. Baseball practice got rained out AGAIN. Sheesh. Sun is shining now. Hopefully it shines on tomorrow’s baseball game. Hopefully I can get my sunscreen on well enough for tomorrow’s baseball game, last week’s sunburn is now peeling. Oh, gotta go. Will wants my computer, he’s ready for another programming session. this is so freakin cute…i love it. i like the ‘d’ and ‘b’ best of the letters but they are all cute. i like that they are all different quilty designs. great little play day you had there. Well I love it Suzanne. The design elements you used look great. So CLEVER! I love all of it. How fun! I think it looks great, the faults are for you only to notice. Stinkin’ cute! Love this and all the thread play you’ve done. Very nice! I love it! Of all the critters I’ve stitched, I’ve never thought to stitch a ladybug. I’m gonna have to start! I think the stitching on the d is my favorite! 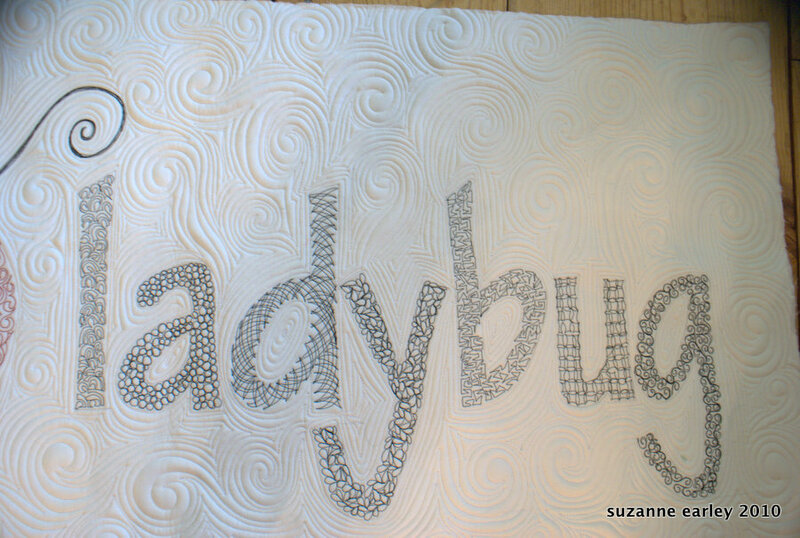 Love the ladybug, and the lettering looks great with the different textures. I also love the poofy bits in the background ….. without them the background would be a rather bland texture. This is really cool Suzanne! I would never have thought to do this – and I am fascinated by all the different stitching. As far as being critical, they always say the last nose on your quilt is your own. I see nothing but great! Back from vacation and catching up on one of my favorite blogs. 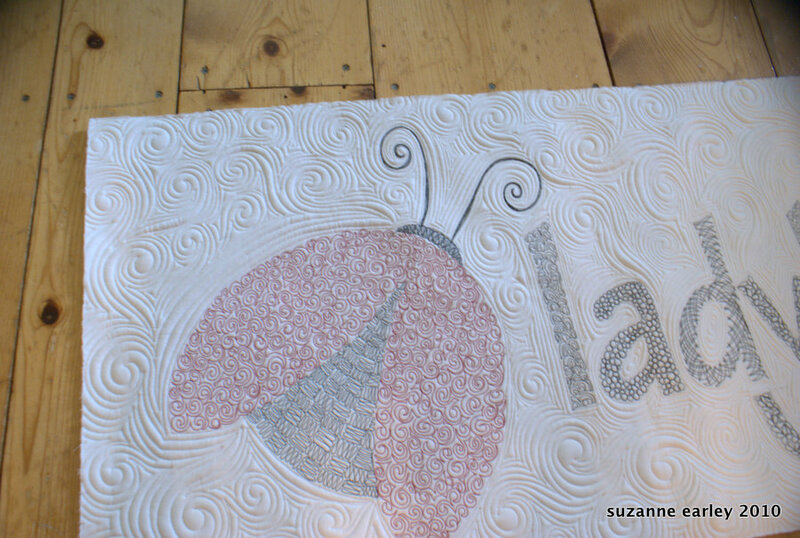 LOVE THE LADYBUG QUILT! Very creative! Got my creative juices flowing now!